I had dinner last night with a good friend of mine who gave me his impassioned reasons why we should abolish national, yearly standardized tests and his skepticism of the Common Core. My friend’s main argument is that standardized tests harm low-income, minority students. He cited Claude Steele, psychologist who coined the term “stereotype threat” (and who wrote Whistling Vivaldi which we reviewed here) who said that the main thing our current standardized tests do is tell poor kids that they are less than average and that they are needy. And Steele said he couldn’t think of anything more damaging to the psyche of low-income minority students. This makes sense to me. My friend’s arguments were solid and gave me a lot to think about. He works on education policy at the national level and works closely with Congressional staffers and others making decisions about education in the U.S. He said he’s floored to find Democrats and Civil Rights groups as the most staunch advocates of yearly, standardized testing. He said it’s as if people don’t stop to think about the implications of their positions or the errors in their logic. I thought that was interesting since we posted yesterday about mindfulness. He also quoted Carol Dweck, researcher on the effectiveness of teaching students that intelligence is not fixed and that with effort you can become smarter. She says that mindsets are super powerful at determining success on tasks but they are also impossibly hard to measure. At the heart of his arguments is the idea that our obsession with “accountability” assumes that teachers, students and potentially parents are some sort of slackers that would just goof off if “big brother” wasn’t measuring every kid, every year. Here at Ed2Save we have been grappling with the idea of assessments, too. What do you think? 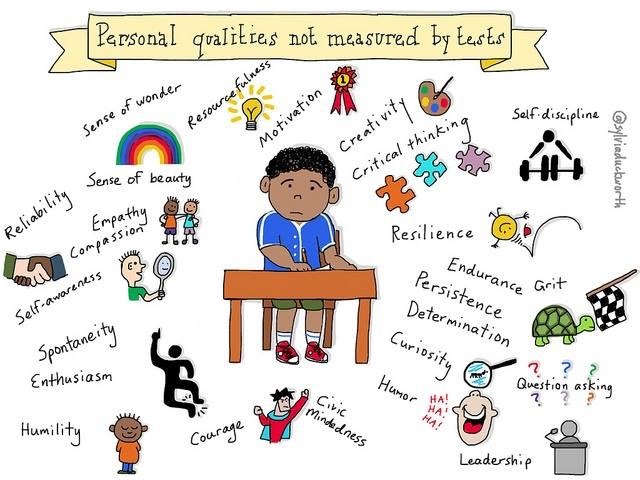 How should we measure learning?